The German pie recipes chosen from Grandma's collection allow you to make delicious dessert pies that are perfect for any occasion. It's a fact that everybody loves to eat homemade pie, and once people taste the unique, Old World taste of these, they'll beg for second helpings. Bake one tonight. Pare and chop 15 apples, fry them in butter, add 4 spoonfuls of apricot jam, and beat until smooth. Then add 1/4 pound of butter beaten to a cream, yolks of 4 eggs, and 1/4 pound of breadcrumbs, a spoonful of vanilla, and 6 ounces of powdered sugar. Spread this over the top of the apples, laid in a shell of paste, and bake 15 minutes in a hot oven. Mix one pinch each of cloves, cinnamon, and mace with 4 ounces of chopped almonds, 2 ounces of chopped peanuts, 2 ounces of citron, and 2 ounces of stoned raisins, the rind and juice of a lemon, and 2-1/2 ounces of breadcrumbs, wet with milk. Beat in 6 eggs the whites and yolks whisked separately, and 4 ounces of sugar. Pour into a shallow dish, and bake in a moderate oven. Turn out when cold, and serve with a sugar syrup flavored with wine or cordial. Line a deep pie-dish with rich pie paste. Let bake and fill with chopped apples, raisins, and chopped nuts, sugar, and a pinch of cinnamon and nutmeg. Then cover with cake crumbs and let bake until done. Beat 3 whites of eggs with pulverized sugar; flavor with lemon and spread over the pudding. Set in the oven a few minutes to brown on top. Take 1 cup of rye breadcrumbs and mix with the beaten yolks of 4 eggs, 1/2 cup of sugar, some pounded almonds, a pinch of cinnamon, nutmeg, and a piece of chocolate grated. Add 1 tablespoonful of lemon juice, 1 tablespoonful of brandy, and 1 of wine. Bet the whites to a stiff froth; add to the mixture. Put in a well-buttered pudding dish and bake until brown. Serve with wine sauce. Sift together a heaping teaspoonful of baking powder and a pint of flour; add a piece of butter as large as a walnut, a pinch of salt, one beaten egg, and sweet milk enough to make a soft dough. 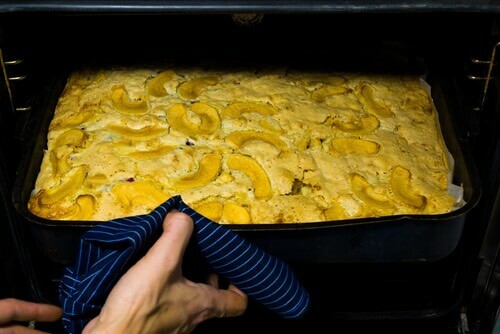 Roll dough out half an inch thick; butter a square biscuit tin or deep dish pie plate and cover the bottom and sides with the dough; fill the pan with quartered juicy apples, sprinkle with a little cinnamon and molasses. A little leftover dough can be used to ornament the pie. Bake in rather quick oven until the crust and apples are cooked a very light brown. Sprinkle a little sugar over the top five minutes before removing from the oven. Ripe peaches are fine used in the same manner as the above recipe. One pint cottage cheese, one-half grated rind of lemon, two tablespoons butter, three eggs, one pinch salt, one-half lemon, one-half pint cream, one and one-half tablespoons flour, one cup sugar. Put the cottage cheese in mixing bowl. Add the melted butter, cream, lemon juice, sugar, grated rind of lemon, and salt. Mix all together thoroughly; then add the eggs separated and beaten; then the flour. Line the form with dough made as follows: One cup flour, one pinch salt, four tablespoons cold water, two tablespoons butter, one-fourth teaspoon sugar, one teaspoon baking powder. Add the baking powder, salt, and sugar to flour; then the butter, and mix thoroughly. Add the ice water and roll dough, handling as little as possible. For this German pie recipe, line a pie form, add the cheese preparation, and bake in moderate oven. Line a flat dish with 1 pound apples, 1/4 pound sugar, 1 gill water (1/4 pint), 1 oz candied peel. Put the sugar and water in a saucepan and boil until the sugar is dissolved. Peel and core the apples, slice them, and cook them in the syrup until tender. Beat them to a pulp. Cut the candied peel into thin slices, and place them on the pastry, pour over the apple mixture, ornament with pasty, and bake in a moderate oven half an hour. Some modern-day Germans find the mention of German pie recipes surprising. However, covered pies and open faced pies known as tarts were being made in Europe since before the Middle Ages, long before they were ever popular in North America. 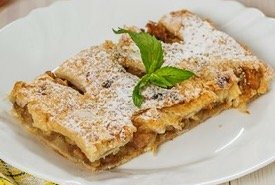 Often, the dough used in German pies like "Kasekuchen" and "Apfelkuchen" resembles more of a shortbread than a flaky North American crust. But, when all is said and done, these treats resemble pies or tarts by any definition. Our German-Canadian friends look forward to sampling their favorite tarts whenever they visit their family back in Germany, but they do say that pies and tarts are more popular in some regions of Germany than others and are likely a regional preference. Want a historical German pie recipe? Here's the English translation of a recipe for pastry dough from an early German cookbook, "Kochbunch der Sabina Welserine," first published in 1553. To make a pastry dough for all shaped pies - Take flour, the best that you can get, about two handfuls, depending on how large or small you would have the pie. Put it on the table and with a knife stir in two eggs and a little salt. Put water in a small pan and a piece of fat the size of two good eggs, let it all dissolve together and boil. Afterwards pour it on the flour on the table and make a strong dough and work it well, however you feel is right. If it is summer, one must take meat broth instead of water and in the place of the fat the skimmings from the broth. When the dough is kneaded, then make of it a round ball and draw it out well on the sides with the fingers or with a rolling pin, so that in the middle a raised area remains, then let it chill in the cold. Afterwards shape the dough as I have pointed out to you. Also reserve dough for the cover and roll it out into a cover and take water and spread it over the top of the cover and the top of the formed pastry shell and join it together well with the fingers. Leave a small hole. And see that it is pressed together well, so that it does not come open. Blow in the small hole which you have left, then the cover will lift itself up. Then quickly press the hole closed. Afterwards put it in the oven. Sprinkle flour in the dish beforehand. Take care that the oven is properly heated, then it will be a pretty pastry. The dough for all shaped pastries is made in this manner. My wife Vicki commented that after reading this historical German recipe, she's glad there's a frozen homemade pie shell kept handy in our freezer! Whether it's the classic no upper crust apple or peach fruit pie, the German apple tarts, or the vintage German cottage cheese pie, these delicious Old World treats are certain to please the most discriminating palate. You'll love serving these traditional German-style desserts to your family and guests anytime. 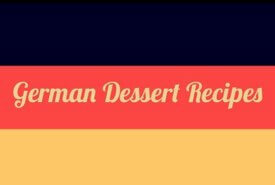 Select one of the German pie recipes and make a delicious homemade dessert tonight. These pies are great to take on a picnic or to a party too. People love them!